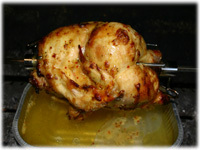 BBQ rotisserie recipes are real time-savers and this rotisserie chicken recipe is no exception. If you've got a little extra time and can let the chicken marinate overnight in the Garlic Ginger marinade then the flavors are even more impressive. 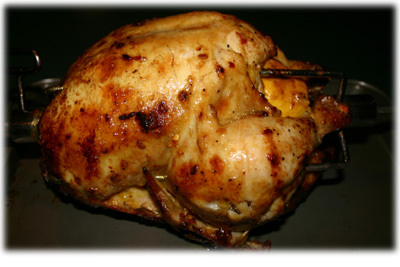 The other "trick" to this rotisserie recipe is to "stuff" the chicken with lemon, lime and garlic before inserting the rotisserie spit so the flavors infuse into the meat as it cooks. A hint of curry and some red pepper flakes gives this barbecue chicken fantastic flavor and adds a little color to the chicken when it's cooked. Note: for best results marinate the chicken 3 hours up to overnight. 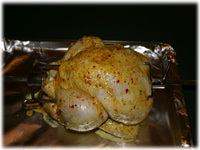 With your fingers lift some of the skin away from the meat of the chicken to allow for maximum marinade penetration. Wash the chicken inside and out and pat dry with paper towels. Slice the lemon and lime in half and peel 3 cloves of garlic. Insert these into the cavity of the bird using one of the lemon pieces to seal off the opening. 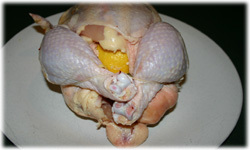 Tie the legs together to keep the "stuffing" inside and keep a uniform shape while on the rotisserie. Mix all the ingredients of the marinade recipe in a glass jar with a tight fitting lid. Shake the marinade well. Let sit for 10 or 15 minutes to allow the flavors to blend. Put the chicken in a resealable plastic bag if possible (if not use a glass bowl). Shake the marinade again to re-mix and pour the marinade over the bird and seal the bag (or bowl). 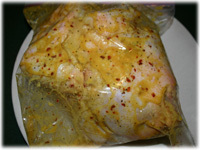 Place the bird in the refrigerator at least 3 hours or up to overnight (best) to marinate. 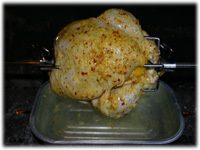 Assemble the rotisserie motor and brackets to your grill according to the manufacturers directions. Set up the grill for indirect heat and place a disposable aluminum pan half-filled with water over the burners. You'll likely have to remove all the grates to give the chicken enough room to spin freely in the bbq. Preheat the grill to 325F - 350F and indirect heat. With 1 set of rotisserie prongs on the skewer insert the skewer in one end of the bird and out the other making sure none of the "stuffing" get's pushed out. 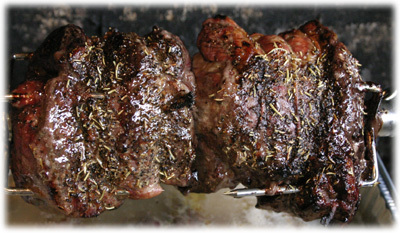 Insert the first set of prongs into the end of the bird and tighten on the skewer. Slide the second set of prongs along the skewer, insert in the other end of the bird and tighten. You'll have to re-adjust the position of the bird on the skewer rod once you install it in your bbq. Install the chicken in the grill on the rotisserie motor. Follow the manufacturers directions to ensure it's properly balanced and will spin freely. Make sure the aluminum pan is under the bird. It should be big enough that any drippings go in the pan. Check the rotisserie occasionally to ensure it's spinning freely. Use an instant read thermometer in the thigh area or breast but make sure the thermometer is not touching a bone. 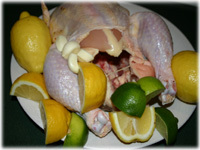 The chicken is done when the internal temperature of the breast meat reaches 165F and the juices run clear (not pink). 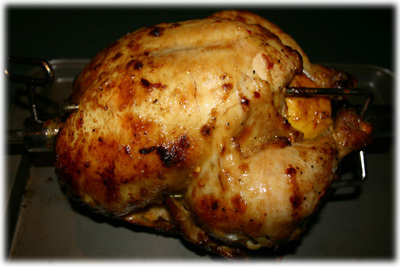 Remove the rotisserie skewer and cover the bird with aluminum foil. The temperature will continue to rise slightly.